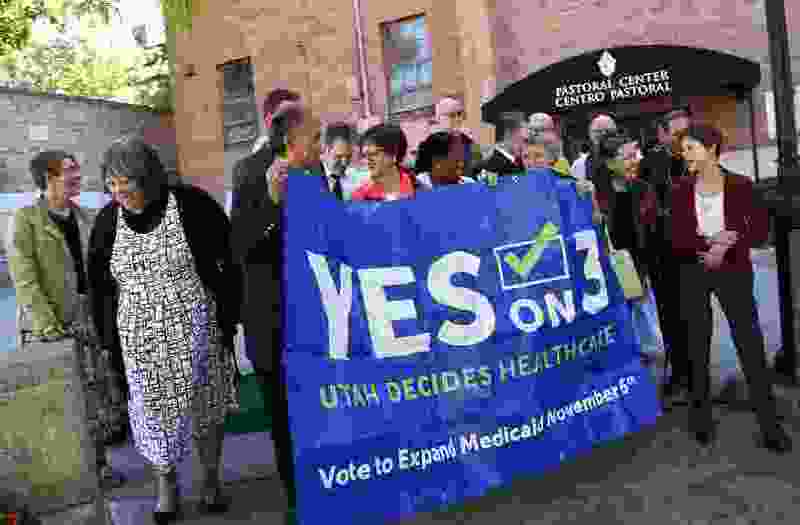 (Francisco Kjolseth | Tribune file photo) Utah faith leaders gather at the Cathedral of the Madeleine in Salt Lake City on Wed. Oct. 3, 2018, to make a joint statement in support of Prop 3, which would expand Medicaid in Utah. The initiative, which earned a majority vote statewide, was supported by voters in 59 percent of the state's House and Senate districts, according to an analysis of vote results by the Utah Health Policy Project. In addition to winning a majority vote statewide, Utah’s Proposition 3 — which fully expands Medicaid in the state — earned majority support in 17 out of 29 state Senate districts and 44 out of 75 state House districts. Those numbers come from an analysis of vote results released Friday by the Utah Health Policy Project (UHPP), which supported the ballot initiative and which is opposed to efforts by lawmakers to amend or potentially repeal Prop 3 through the addition of enrollment caps, work requirements or delays. Slonaker said the analysis looked at precinct-level election results to find the vote margin in each legislative district. There’s been an assumption that Prop 3′s support was concentrated in Salt Lake County, he said, but the numbers show that 59 percent of lawmakers in each chamber represent an area that voted to enact the initiative. Among the districts where the initiative succeeded were those of Senate President Stuart Adams, R-Layton, and Sen. Allen Christensen, R-North Ogden, who is proposing to roll back the initiative through enrollment caps, work requirements or delays. The initiative failed in the districts of House Speaker Brad Wilson, R-Kaysville, House Majority Leader Francis Gibson, R-Mapleton, and Senate Majority Leader Evan Vickers, R-Cedar City, according to the UHPP Analysis. During a special session of the Legislature in December, lawmakers voted to replace a ballot initiative legalizing medical marijuana with a plan of their own design. A common argument raised by several lawmakers was that while that initiative — Proposition 2 — had succeeded statewide, it had fallen short in a majority of legislative seats. Christensen said Friday that the broad popularity of the initiative doesn’t change the need for modifications. 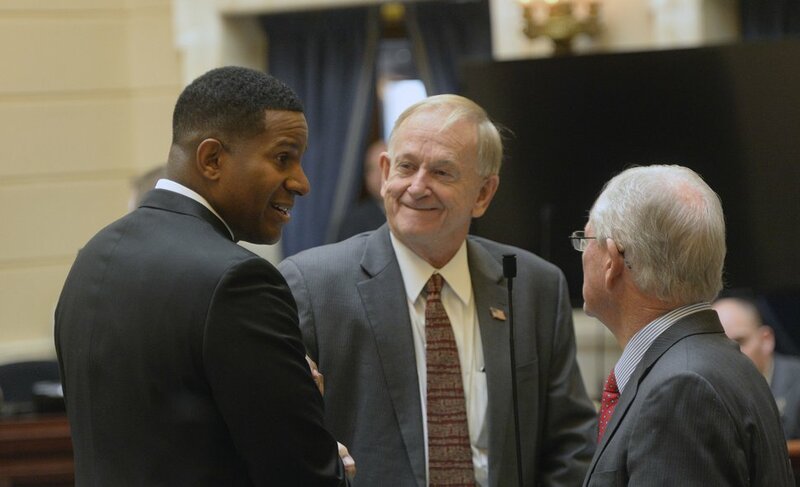 (Al Hartmann | Tribune file photo) Sen. Allen Christensen, R-Ogden (center), is shown during the 2016 session of the Utah Legislature. He is pushing for changes to the full Medicaid expansion approved by voters statewide and in his district, who, he says, passed it "without a "thorough understanding" of what the initiative did. Christensen said he expects his bill — which was publicly released on Friday — to be considered in the early days of the session. In its current form, it stops Prop 3 from taking effect and seeks waivers from the federal government to impose spending caps and enrollment restrictions on the state’s Medicaid program. “We’re still trying to get it just right,” he said. Asked if the characterization of his bill as a “repeal” is fair, Christensen made the comparison of repealing a 50 mph speed limit to allow driving up to 60 mph. “If you supersede an issue, I guess you can call that ‘repeal,’” he said. A second bill overtly repealing the initiative, as well as a partial Medicaid expansion approved by lawmakers last year, was also released Friday. Before November’s vote, Lehi Republican Sen. Jacob Anderegg said he planned to sponsor repeal legislation, only to backtrack from those comments after the initiative earned majority voter support. On Friday, Anderegg said he had reconsidered once again at the urging of colleagues in the Legislature who support a full repeal of Medicaid expansion in the state. The UHPP analysis shows Prop 3 failing by a margin of 40 percent to 60 percent in Anderegg’s district. But Anderegg said he had reviewed data that showed 80 percent of his constituents opposing the initiative, and Prop 2 failing in a majority of Senate districts. Statewide, Prop 3 earned 53 percent of the vote. But Anderegg dismissed that number, saying that not every Utahn cast a ballot. (Rick Egan | The Salt Lake Tribune) Sen. Jacob Anderegg, R-Lehi, asks questions during a special legislative session at the Utah Capitol, Wednesday, July 18, 2018. Anderegg is sponsoring legislation to repeal a Medicaid expansion initiative approved by voters in November. Utah saw near-unprecedented voter turnout for a midterm election in 2018, hitting a more than 50-year high for nonpresidential election years. At the time the election results were certified, Utah Lt. Gov. Spencer Cox described the jump in turnout from 2014 to 2018 as “ridiculous” in a good way. Rep. Jim Dunnigan, R-Taylorsville, who has sponsored partial expansion plans in the past and who is seen as a potential House sponsor for Christensen’s bill, said the vote results inform his thinking on the issue of Prop 3. Legislative leaders have questioned the cost of the initiative, saying that Prop 3’s sales tax increase falls short of the anticipated expense of providing health-care coverage to 150,000 low-income Utahns. Voters in Dunnigan’s House district supported the initiative by a margin of 58 percent to 42 percent. Dunnigan said he has been involved in some of the discussions regarding amendments to Prop 3, but that he is not familiar with the current version of Christensen’s bill. Utah Gov. Gary Herbert spoke in favor of allowing Prop 3 to take effect during his monthly televised news conference last week, while alluding to future tweaks to maintain the program’s sustainability. He said there is a question of how to pay for expanded coverage over the long term, but also said there is logic in allowing the initiative to take effect to better understand its impact on the state budget.